Students take part in modelling the phases of the moon activity using Jaffa Cakes! Some of our home-schooled students have been looking at the topic: The sun, moon, and stars during Science lessons. The children reviewed what they have learned previously and then focused on the area about phases of the moon. Students got to learn that the moon doesn’t actually change shape—it just appears to change as it orbits Earth. 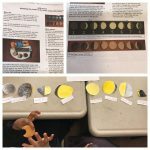 The children took part in the modelling the phases of the moon activity using Jaffa Cakes to help them understand the concept by labelling the phases of the moon using the headings provided. The children also completed a matching activity which asked them to draw a line to match each moon phase with the sentence that tells them about it.